"They're very lucky to have you"
I appreciate the comment but I don't know how to answer that. I smile, make a slightly awkward noise and give the stock reply of a slightly embarrassed Englishman. "Oh......erm...........I'm not sure about that"
Then I change the subject. "Look, (points upwards) a hot air balloon." I have no answer for the same reason any parent would have no answer. They had no choice, they didn't ask to travel through life by this route and luck played no part. If luck did play a part then they appear to have had very bad luck. I know no offence is intended and none is taken. Perhaps I should just say "Thank you." It is a tricky one that one... I always just mentally sub-edit the comment to... "They're lucky given the cards that they were dealt in life and the likelihood of what their life would have been like if they hadn't been taken into care or ended up placed for adoption..." which is probably what they mean anyway. 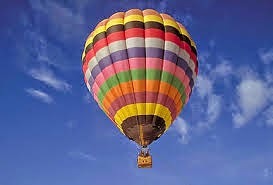 And then like you I smile and go, "Oh look, a hot air balloon!" or say "Thanks..."
It's gets said so often and I always have no idea how to reply to it really. I usually say I feel very lucky to have them. But it's a tricky one for sure. I might just pretend to see a hot air balloon next time. We have had several people say recently 'he's a credit to you', which is slightly different, and 'you've done a good job with him', which is different again. I try very hard not to feel patronised, he's not some kind of second class child who has unexpectedly not murdered us in our beds. I try and concentrate on the positive thing they're thinking, 'what a fine young man he is, weren't you lucky to get him in the lucky box of life'. Mostly it works! Part of me feels like I just can't be bothered with the whole explanation of how I can't see the situation in terms of luck, fortune and chance. Thank you for you comment. I have no idea how you find the enthusiasm to comment on every linked blog.